Stephanie Carr faces off with a Northwest Christian player. 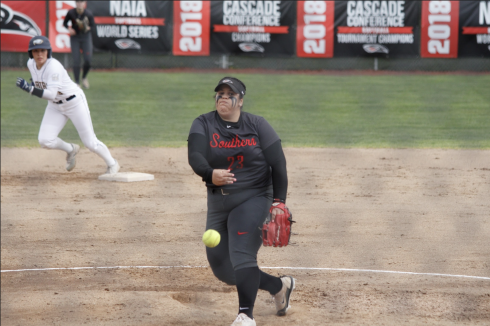 Stephanie Carr scored the eventual game-winner to set a new career record as Southern Oregon defeated Northwest Christian 3-0 on SOU’s Senior Day Sunday afternoon at University Field. 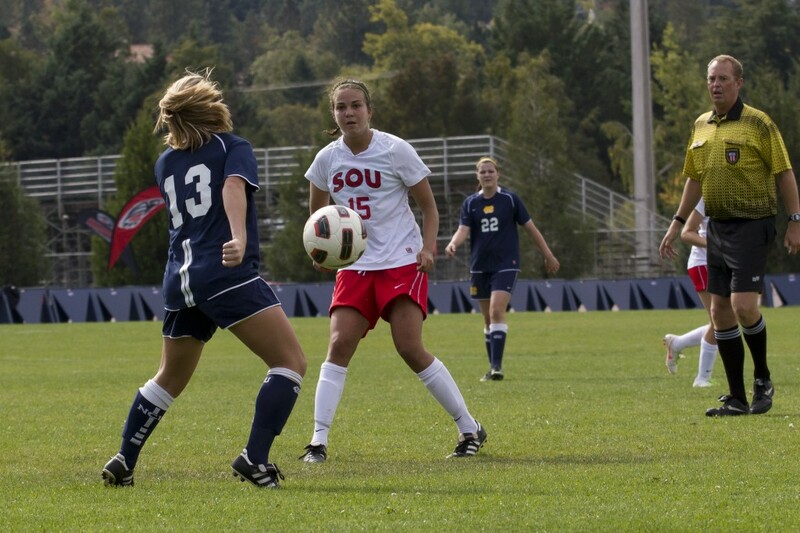 Southern Oregon improves to 7-5-2 overall and 3-2-1 in conference play, while Northwest Christian falls to 5-7-2 overall and 3-3 in the CCC. The Raiders honored seniors Krista Borman, Carr, Stacy Hamer and Lauren Maserjian prior to kickoff of the final home match of the 2012 regular season. Sydney Paulsen makes an attempt on goal. Carr scored her 10th goal of the season and the 33rd of her career to break a tie with former Raider Katie Emerson for the program record. 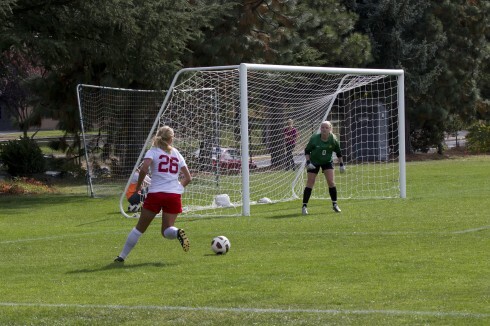 She broke a scoreless tie in the 33rd minute when she took a pass from Chloe Welch to the left side and knocked it into the bottom corner of the net from 17 yards out. Carr runs toward a pileup on the soccer field. Less than four minutes later fellow senior Hamer made it a 2-0 advantage when she scored from 11 yards out on a pass from Alex Balistrieri on the left side. Southern Oregon’s final goal came in the 71st minute, with Carr passing from the left corner to Julie Zamzow in front of the net for the score. 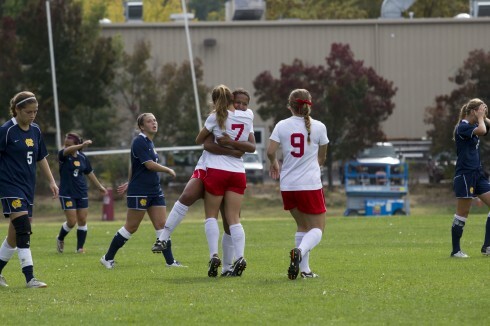 Teammates congratulate Stacey Hamer on her goal. The Raiders outshot Northwest Christian 33-2 in the match, led by Sydney Paulsen with 10 shots. 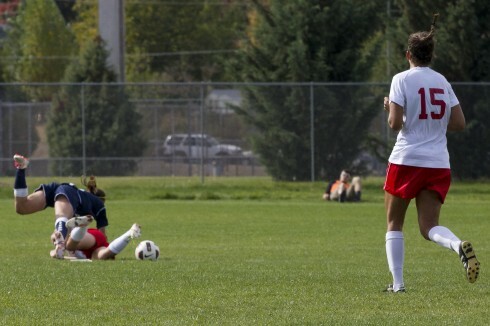 Southern Oregon goalkeeper Katelyn Allen tallied one save in earning the shutout for SOU, while Kristen Fulbright made seven saves for Northwest Christian. Sydney Paulsen throws the ball back in. 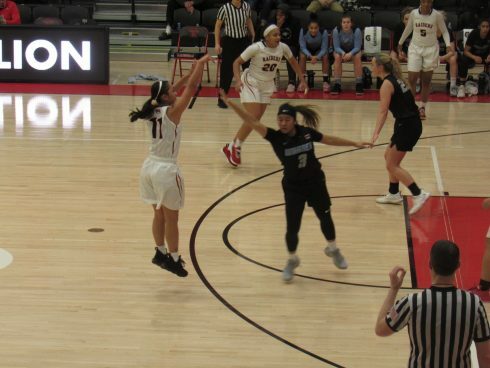 Southern Oregon returns to action next Sunday, when the Raiders will travel to Klamath Falls for a 3 p.m. conference matchup with rival Oregon Tech.